If you love a speedy, crunchy and spicy meal that takes five minutes to put together then these Fish Tacos in their crunchy lettuce boats are just for you. In my other life, (the one I go to when I’m not blogging or cooking), I have to be pretty organised to ensure that the multitude of things that need to happen do happen when they should (ie on time and preferably under budget, as they say!). And if not then it all just falls apart – including me. So you would think that this should roll over to my cooking life as well? And to be fair, for the most part it does. If I’ve had an organised shopping weekend then I’ll know what I am cooking for dinner days ahead. If I’m only middling organised then I’ll start thinking about what to make for dinner early in the day and scan the fridge for ingredients before I leave for work. And of course, if I’m completely fallen off the organising train then it may be on the drive home from work that I then start to think about it. Does that sound like you?? Eating fresh whole food and cooking the primal/paleo way means that where I live, you can’t call in for a takeout or pop into the store for a pre-packed paleo meal that isn’t a bit of cardboard, full of unpronounceable and suspect ingredients. So for those days when I want something fresh, crunchy and maybe a bit spicy and I really don’t want to fuss or take hours of hard work to put something together, then having a few super quick meals is a must. These need to be something you can throw together from what you already have or with only a minimal whizz around the store to gather things together. One of my new favourites in this category are these Fish Tacos. 1 tablespoon chili powder depending on heat you like! Cut your fish into 10cm long chunks. Beat egg and place fish into this mix. Add taco seasoning mix to the coconut flour and place on a flat plate. Coat each eggy fish piece in the taco coconut flour mix. Heat your butter and oil in a frying pan. Add the fish and cook each side until brown. Serve on a lettuce leaf with avocado, tomato and sour cream dip on the side. See didn’t take long at all! That looks delish! Breaded fish I can eat.. What?! 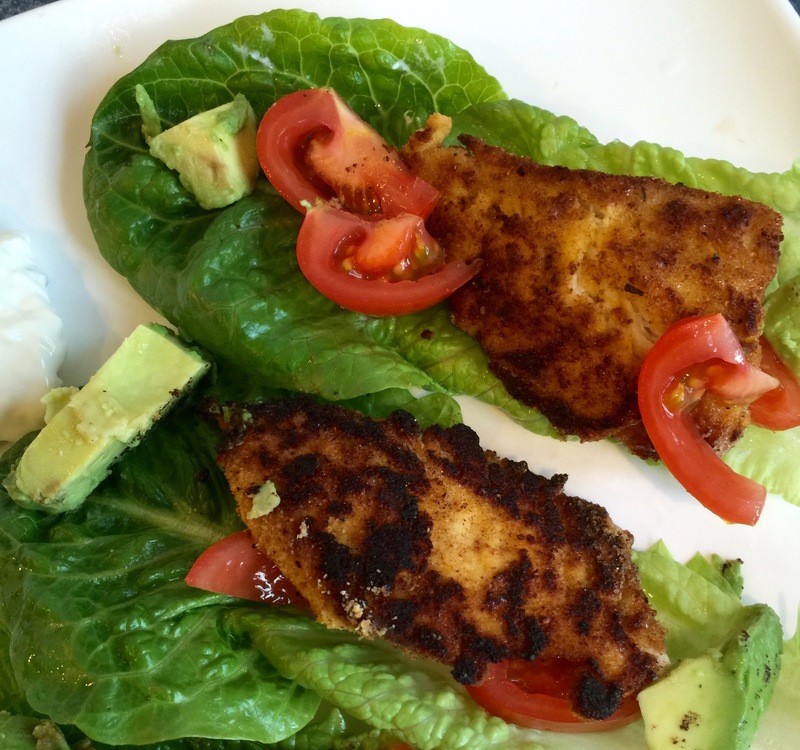 I have tons of meal-planning recipes on my site, some yummy fish dishes, too! I hope you check out my blog/follow, it’s wheat, rice, and oat free!! !